At the very heart of Vienna, you find the Stephansdom Cathedral, one of the finest buildings of late Germanic Gothic art in Europe - and the Haas Haus, a shopping mall with a reflective façade that was designed by oh-I-am-so-great-adore-me architect Hans Hollein. Surprisingly, when the mall was built in 1990, the Viennese - usually so very fond of change, progress and innovation - hated the new Haas Haus to an extent that they were close to lynching poor Hans Hollein. In my opinion, for a shopping mall, the Haas Haus actually looks quite appealing. Furthermore, one needs to take into account what the site had been occupied by before the construction of the Haas Haus. The previous building was erected in 1866 - an important year in Austrian history, since it transformed the country into a federation with Hungary as an almost equivalent partner. The landlord was a local carpet company from Vienna - this was in the 19th century and thus in a time when not every carpet trader was of Iranian descent. "Philip Haas & Söhne" hired two star-architects of the historicist period, August Eduard van der Nüll and Siccard von Siccardsburg. The gay couple had also designed the Staatsoper, the Austrian national opera just down the Kärntner Straße Road. With the nastiness of WWII, this original Haas Haus was destroyed in 1945 and replaced by a provisory building with no architectural value in 1953. Almost 40 years passed. Then, in 1990, the new Haas Haus was opened: It was designed to echo the outline of the Roman ditch that followed today′s Graben and the corner of the building marks the edge of the Roman army camp. 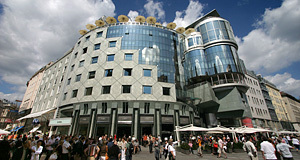 Once the building was opened, Austrian tabloids discovered "Haas Haus bashing" as their new theme of the season. This resulted in the architect giving in and "downgrading" his designs for the square in front of the building. Some more years passed and the Viennese finally discovered other important things to talk about (for example, about themselves, about the weather, or about themselves again). Today, most people will acknowledge that the Haas Haus is an important example of late 1980ies architecture. The Haas Haus is also an important venue for political TV shows produced by my former employer, the Austrian National Broadcast ORF. The roof is occupied by a luxury restaurant and grants spectacular views on the Stephansdom and the historic city centre of Vienna. Nearby attractions - well, pretty much anything in the city centre. So I will name only sightseeing attractions within a five minute walk: The Pestsäule or Trinity Column; the Graben, Kohlmarkt and Kärntner Straße; the Hoher Markt Square; the Peterskirche; and the Jewish Museum.